Electronic cigarettes (or e-cigarettes) have started to become a popular product, touted as a safe alternative to the traditional cigarette. Unlike traditional cigarettes that give off harmful second hand smoke, e-cigarettes give off a vapor that supposedly lacks the dangerous chemicals found in conventional cigarettes. The FDA has not officially reviewed these products, so it is unclear if electronic cigarettes are as safe as they claim to be. Atomizer — Used to heat liquid to create vapor. E-Liquid — Propylene glycol (a safe food additive) and flavoring, which can include nicotine. Some believe that the lack of evidence proving e-cigarettes are safe is a reason to avoid them. 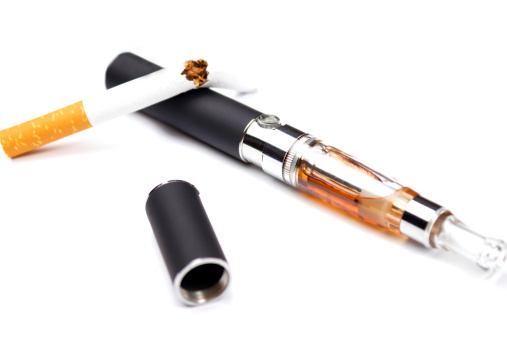 While e-cigarettes are smokeless, and don’t contain the tobacco and harmful carcinogens found in traditional cigarettes, the fact that they can carry nicotine could pose a health risk. The continued use of nicotine can lead to nicotine tolerance, which can cause depression and forces users to take higher levels of nicotine in order to feel the same effect. It’s our view that nicotine, a highly addictive substance, should be avoided in any form. Be the first to comment on "All About E-Cigarettes"